There are variety of cnc machines in the market, and almost every cnc machine in a cnc workshop has different kind of cnc machine controls if controls are not different they might have different versions of the same cnc machine control. As the operating of different cnc machines controls is very much different from one another the same way Tool Offsetting is very much different. Here I will discuss the cnc tool measurement on Fanuc. Some cnc machines has some kind of built-in mechanism of tool-offsetting, this built-in mechanism of tool-offsetting makes adding new tools are changing existing tools a breeze, because you just tie-up the tool in the tool-post on the cnc machine tool-turret and just perform the procedure the cnc machine manufacture has given in the cnc machine operating and setting manual. The Fanuc controls such as Fanuc TC has this capability, Just tie up tool in the tool turret and perform a simple procedure and everything is done. The tool offsetting procedure might be different from version to version, But on Fanuc TC this procedure is simple as under. For tool offsetting of a new tool just tie up the tool in the tool post and in MDI (Manual Data Input) Mode call up the tool in the working position by entering the command T1, the T is for tool call up and 1 is tool number if you have your tool on another position you might change that with that tool number. Now change the cnc machine to Jog Mode and touch the tool cutting point to the finished component (already gripped in cnc machine jaws) face and bring the Tool-Geometry page and enter under the tool number the command MZ0 this command will clear any previous values and will measure the current tool’s tool-offset in Z-axis. Now touch the tool to a known-diameter on the component and again in the tool-geometry page enter the command MX50 you can enter the measured diameter value instead of 50. 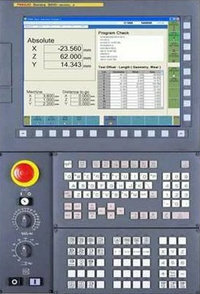 This way now we have calculated the tool-measurement on the Fanuc TC cnc machine control. Sinumerik 808D cnc from Siemens is easy to set-up and run. 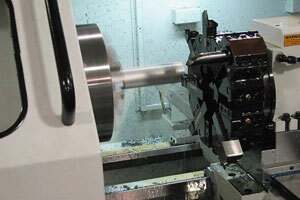 As this video shows how a cnc machine turning, threading tool can be easily measured for tool offset setting….